When a small boy is neglected by everyone at court but the nine tailed fox in disguise Tamamo-no-Mae, the seeds are sown for the revenge and creation of one of Japan’s most devastating Yokai. Prince Akihito just wants to be accepted. As the next emperor of Japan the small child should be dotted upon and idolized. The true nature of his birth means his “father” the emperor openly dislikes the child and the entire court follows suit. Everyone that is except for the emperor’s favorite consort, the beautiful Tamamo-no-Mae, a woman so beautiful and talented that she can not be human. Together the two inadvertently start the young boy down a path that would lead to the rise and fall of his powers and a pack with Shinigami that will be felt throughout Japan for all time. 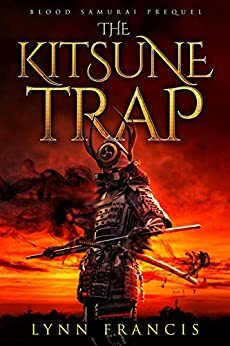 The Kitsune Trap is a short story prequel in the Blood Samurai series. It tells of how Sutoku came to choose the path of vengeance that lead him to become one of Japan’s three evil Yokai and his need for the Kitsune’s child Riku to complete his revenge.